Minimalist Wordpress Themes for 2018 - Feast Design Co. Contrary to popular belief, minimalism isn’t about subtracting. More specifically, it’s about adding focus to what’s important. It’s about what’s important to you, and the image – and message – you want to convey to the world. And it’s about what’s important to your readers: your content. When your visitors come to your website to pick up a brand new recipe, they’re there for instructions and guidelines, witty quips, and gorgeous pictures they can tag to their #foodporn Pinterest album. 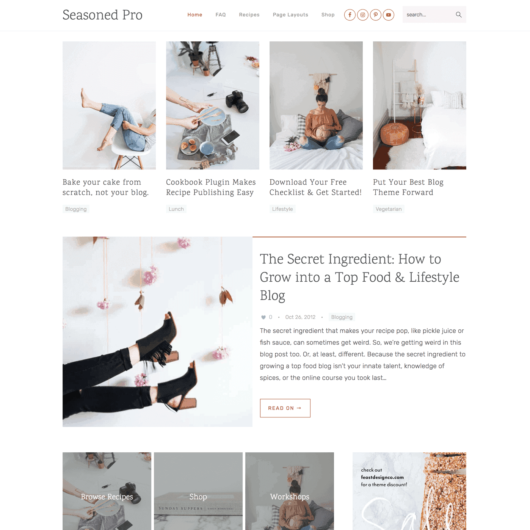 Our minimalist themes help you deliver that, just like they have for 10,000+ other bloggers. A minimal, toned down, monochromatic color scheme helps to visually reinforce what is background, and what is foreground. Whites, greys and neutrals provide structure to your site, and allows colorful food photography to pop, drawing attention to your content and enticing clicks. Vibrant leafy greens and deep red berry hues are unmissable against a clean backdrop. Elegantly crafted white space that has been painstakingly created by professional designers helps your content flow seamlessly. Each paragraph, image and recipe are balanced by appropriate spacing to make reading a pleasure. With a minimal layout, small decisions count. Having the ability to use your admin panel to fine-tune and adjust your header, navigation, footer and sidebar are critical to maintain usability. All of our themes are full responsive, maintaining clean appearances across desktop, tablet and mobile. This graceful degradation is crucial in a world where mobile is exceeding 50% of traffic on blogs. Visitors want to quickly and easily find the recipe they’re looking for on your blog, without clutter getting in the way. We help you give that to them. With user experience becoming more important as search engines evolve to better serve searchers, every extra second spent on page and every percentage lower bounce rate counts. 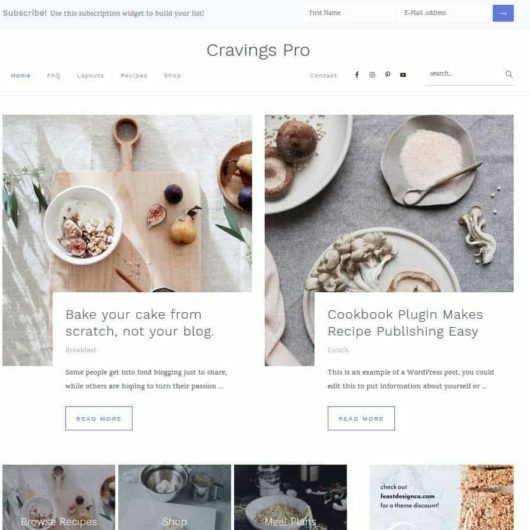 Coupled with low page load times and built in compatibility with image and file caching, you’re set to join the best food blogs with best-practices at the forefront of the industry. Food bloggers love us, but they’re certainly not the only ones. Whether you’re a foodie or designer, finance consultant, professional photographer or vegabond, our themes are fully customizable to suit any industry.